Durgash gro-Rushub is a hostile Orc healer located inside the shrine of Ashurnibibi. 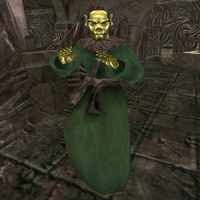 He is wearing a common robe, he wields an orc warhammer, and he holds an ancient daedric key to a locked and trapped door nearby. Like all Orcs, he has a natural resistance to magicka, and can boost his health, fatigue and attack for short periods, at the cost of agility; otherwise he knows no spells. This page was last modified on 23 April 2014, at 17:37.